This one was a perfect concoction that created the most wonderful color: about 5-8 strawberries, tsp fresh ginger, tsp of coconut flakes, 1/4 cup almond milk and full glass of water. The final touch was mint leaf on top. The color was so good -- it felt worthy of a wine glass. My venture with leeks. I have been wanting to cook these guys for a while and finally I bought them at Whole Foods. They were calling me every week to go for it and just try out a new ingredient. Strangely, the idea of cooking leeks started decades ago. I was watching a movie and the character said, "Leeks! That's what you need. Leeks!" He was so adamant and dynamic about his enthusiasm that this pretty green vegetable took on a lore for me. Finally it was time. I looked up dozens of recipes and created a hybrid. Chopping off the roots of the leeks I left the rest intact and dunked them in boiling water for about 15 minutes, until soft. While I was waiting, I created the most scrumptious marinade (see below). And wow... just divine. Everything i could have hoped for -- the leeks were packed with taste and the marinade was delicioso! However, I didn't have a lot of the ingredients so here's my hybrid: Splash Kosher Salt, 1/4 cup chopped white onion, 1/2 garlic clove chopped, 1 tbsp red wine vinegar, 1 tsp yellow mustard, 1/2 tsp chopped fresh thyme, 1/4 cup olive oil, 1/4 tsp brown sugar, bit of black paper. 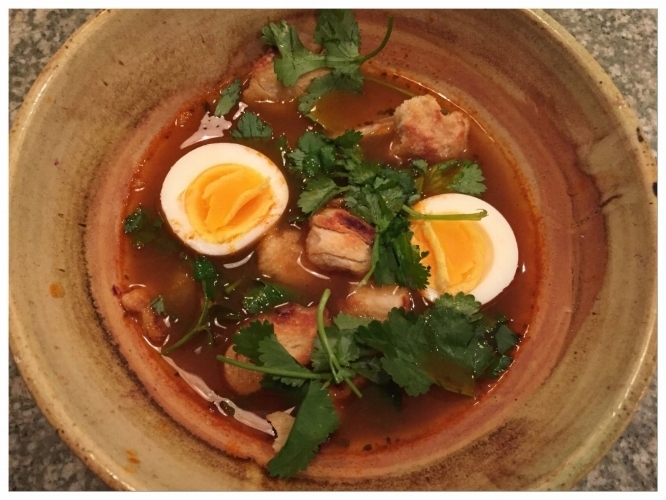 This Tunisian soup had more ingredients and steps than any recipe I’ve ever tackled (pathetic, but true!) I waited until I had a solid couple of hours, to take my time, be patient going from the recipe to the stove, carefully measuring and hunting for spices hidden in racks that had not been open in years, to test and taste the ingredients and adjust the recipe (which i love to do). And when it was done… every bite was warm and refreshing – an awesome contrast of fresh parsley and cilantro with vibrant spices (cumin and Harissa) plus a kind of sour and mouthwatering note of capers and green olives… an acidic splash of lemon – toasted croutons to absorb and balance the flavor and a hard boiled egg cut in half to brighten the soup with a beautiful colored yellow and soft white. Cookbooks are a go-to for inspiration. I can stare at them for hours, soaking in the recipes, as well as the history and culture, the beautiful images and intricate design. I write biographical books for a living, and cookbooks (even when I wasn’t cooking) have always been a favorite to read. I'll be posting a new cookbook each month, starting with a few from my mother's cooking library.